The highlight: An outstanding team performance with the ball nearly snatched victory out from under a strong Queensland side. Georgia Wareham had an impact as soon as she was brought into the attack, taking three wickets for 45 runs off her 10 overs. Alana King was also effective with the ball, finishing with figures of 3-42 off 10 overs. The opposition: Queensland captain Kirby Short led the charge with the bat, top-scoring with 45. Whilst there were no other significant individual totals with the bat, the entire QLD lineup chipped in to ensure they reached the winning target with 1 wicket and 4 overs to spare. The win helped Queensland qualify for the WNCL final. Notable: A handy 62-run unbeaten partnership between Molly Strano (44*) and Nicole Faltum (32*) ensured the Vics set a competitive total for the Fire to chase, despite the loss of early top-order wickets. The highlight: Victorian and Australian captain Meg Lanning was back in full-flight with the bat, notching up her second century for the WNCL season in a Player of the Match-winning performance. Lanning scored 105 off 101 balls, in an innings that included nine boundaries. The opposition: A 97-run opening partnership between Stefanie Daffara and Georgia Redmayne initially made the target of 261 look very achievable for the Tasmanians. However, when Rhiann O’Donnell got the breakthrough wicket of Daffara, their innings began to unravel. A hard-fought 53 off 45 balls from Veronica Pyke also helped to keep the game alive for the visitors. Notable: It was a pity to see Annabel Sutherland just fall short of a half century, after rectifying a slow start with the bat to score a well-made 48 batting alongside Lanning. The lower order combination of Strano and Faltum was again effective with the bat, piling on another 79 runs between them. 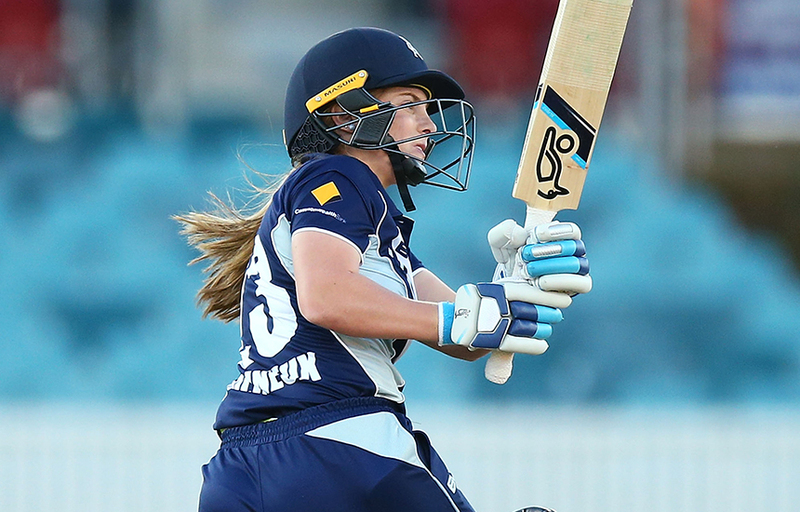 After finishing the 2018-19 WNCL season in fifth position, the final game of the regular season also signifies the end of Victoria’s WNCL campaign. Victoria finished the season on 9 points following two wins from six matches (one with a bonus point).